Learn THE BEST way to grill salmon that will blow everyone’s mind! Yup, I’m that confident! Soak the cedar plank in water for at least 30 minutes. In a small saucepan, add maple syrup, water, vinegar, cornstarch, garlic, salt and red chili pepper flakes; whisk well. Bring to a boil, reduce heat to low and simmer for 7-10 minutes or until thickened. Reserve 1/2 cup for cedar plank salmon and transfer remainder to a glass jar. Use with meats, seafood, vegetables and for dipping. Highly recommend to make Thai Salmon that everyone will rave about for weeks! Preheat grill to medium-high heat (500 degrees F). Place salmon on pre-soaked cedar plank and brush with half of the reserved 1/2 cup Thai sauce. Place on a grill, cover and cook for 10 minutes. 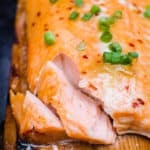 Open the grill, brush salmon with remaining sauce, cover and grill for another 10 minutes or until the thermometer inserted in the deepest spot reads 130 degrees F.
Cut into 8 slices and serve warm right off the plank placed on a platter. You can brush salmon with more Thai sauce if desired.